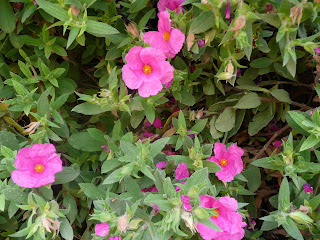 Going back, near the bus stop I find this Cistus (which one is it? I don't know... incanus... or creticus... it doesn't matter; I am interested in names and in botany, but not enough to split hairs). This picture and the picture in top of this one are the last posts of the tour. To get to the beginning of the tour, you have to clic on "gennaio" in the archive list. On the appearing page, again in the archive list, you shall clic on "In Maremma", then the first picture will appear. Enjoy strolling along this wonderful places, and thank you for your interest.